On 21 January 2009, a residence that was built by African slaves more than two centuries ago will be inhabited by an African-American, his wife and their two young children. They will move in not as builders, cleaners or aides but as the nation's First Family. A 47-year-old junior senator called Barack Hussein Obama, whose father grew up herding goats in Kenya and whose wife is descended from African slaves will reside at 1600 Pennsylvania Avenue. Some 147 years after the end of the official end of the Civil War and 44 years after the Civil Rights Act, America has finally exorcised its most stubborn ghost of the past: the original sin of slavery. Despite all the milestones of the recent past, including two African-American Secretaries of State under George W Bush, the legacy of shame lingered on quietly. Frequently it was met with a wall of silence or a welter of euphemisms. Racial prejudice will not end tomorrow. But the debate about it will surely become more honest. We can finally bury the Bradley effect, which had been analysed ad nauseam on cable TV and the web. Americans voted for Barack Obama for a variety of reasons. Some because he was an African-American. Others because he was young, cool and clever. But almost everyone who did vote for him surely came to the conclusion that this was a man with sober judgement. Tuesday's vote was also a vehement rejection of the Bush legacy and the candidate who had become attached to it. From the moment it became obvious that John McCain was going to be the Republican nominee, both Hillary Clinton and Mr Obama, who were still busy slugging it out in the primaries, hung the albatross of the Bush years around the former Navy pilot's neck. 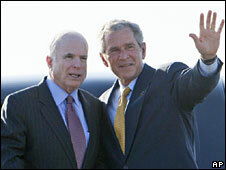 They tried to make Mr McCain's first term look like President Bush's third. It worked because the Vietnam vet had sided with Bush on the Iraq war. In an election in which change had become the resounding mantra, any Republican, even the erstwhile maverick McCain, was swimming against the tide. But it would be wrong to think of this as a tidal wave in favour of the Democrats. Their grandees on Capitol Hill are almost as unpopular as their counterparts from the Grand Old Party. Why, in a gene pool of 300 million people, must the presidential ticket include someone called Clinton or Bush? 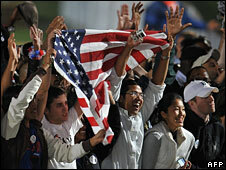 The 2008 race was a people's revolt against America's political Establishment. Yes, even Sarah Palin, the moose slayer, shared the revulsion at the smug politics of dynastic entitlement. This was the lesson that Hillary Clinton had learned far too late in the primaries. The former First Lady argued that she could handle the top job from day one, because she had seen how it's done at close quarters. Why, in a gene pool of 300 million people, must the presidential ticket include someone called Clinton or Bush? Mr Obama's genius was to understand this yearning for change, give it a blindingly obvious name and then plan for it meticulously. The "skinny kid with a funny name", who grew up in Hawaii and Indonesia and came of age in Harvard and Chicago embodied the uprooted, multicultural, messy reality of modern America and made no excuses about it. As he put it once, mocking the hypocrisy of Bill Clinton: "I smoked dope… and, yes, I inhaled. Wasn't that the point?" But Barack Obama is more Tiger Woods than Jimmy Hendrix. He is the first candidate to seize on the insurrectionist power of the internet. Mr McCain prided himself on being a stranger to the web. The Clintons thought they had harnessed its powers because they were friends with the people who owned large chunks of it. But Mr Obama went straight from the service providers to the individual users. At one of his first rallies in Washington DC, I was struck by the dozens of students who had turned up with their own laptop computers to process the new arrivals. They collected the $15 (£9.40) entry fee and, more importantly, they harvested e-mail addresses. In one afternoon, Mr Obama had managed to raise $150,000 and recruit thousands of footsoldiers, who would be sent personal e-mails, instructions and reminders throughout the long campaign. Mr Obama raised more than $600m. Half of it came from the likes of Goldman Sachs and Hollywood. But the other half came from two million first-time donors, many of whom were also first-time voters. As the president-elect used to put it: "It's all about YOU!" The first time I heard it, in the frozen landscape of New Hampshire, it made me cringe. But then I looked around and noticed that the audience was lapping it up. And the only black face in this vast and shivering crowd belonged to Obama himself. He may have started his campaign as an insurgent. But he ran it like a field marshal. He didn't just receive Colin Powell's cherished endorsement, he also used his strategy of overwhelming force to win one battle after another. In the ground war, he established field offices in states where no Democrat had won in a generation. In Virginia and Indiana, which had last voted for a Democrat in 1964, he established at least 50 such local operations, used the money collected over the internet to employ hundreds of paid staff and then used the e-mail addresses of the "citizen fundraisers" to recruit thousands of volunteers. 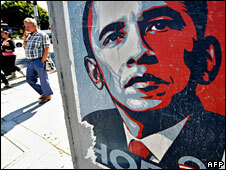 In the air war, Obama bombarded the average household with five times as many TV ads as his opponent. John McCain, the veteran flyboy from the Vietnam War, was like the Red Baron taking on a B52 bomber. On Tuesday it all came together. There was the message of hope and change. Yes, this is dangerously open to wishful thinking, it raises expectations that the new president may never be able to meet, but it has been music to American ears, tired of the cacophony of fear and resentment. Then there was the meticulous planning of a disciplined campaign that didn't leak, didn't quarrel, kept wedded to one central theme and, crucially, didn't panic when the American economy was having a nervous breakdown. Mr Obama's cool judgement during the financial meltdown was the crucial turning point: it made the impetuous McCain seem reckless. It allowed Americans to imagine the younger man as the sober, designated driver of this country. Tuesday showed us once again that history travels in packs. The 4 November was the day the internet triumphed over television as the prime medium of politics. The Starbucks generation overtook the Dunkin' Donuts generation. The baby boomers - now in their sixties - bowed to a tribe of politicians so fresh they're still looking for a cliche. It was the day that politics caught up with demographics, that multi-cultural America gave voice to African-Americans as never before, but also to Asian-Americans and Hispanics. You would expect Louise Roberts, the black hairstylist in Culpeper, Virginia, to cry and "praise the lord for this gift". Her mother and father couldn't even sit in the front of the bus or share a cheese sandwich with white Americans 45 years ago. But I never expected to see my neighbour Dave, a staunch Republican and a partner in a Washington law firm, pin an Obama-Biden poster into his immaculate front lawn on the night of Halloween. Moderate Republicans - call them Obama Republicans after Reagan Democrats - will be a tempering influence on the new president and his Democratic majority on Capitol Hill. He will ignore them at his peril. 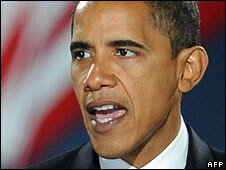 But Obama the silver-tongued lawyer has always preferred consensus to conflict. Like most of his predecessors in the White House, he will move to the centre and realise that this is the only place from which to govern a country that loves ideas but distrusts ideology. Matt Frei is the presenter of BBC World News Americawhich airs every weekday on BBC News, BBC World News and BBC America (for viewers outside the UK only).